Sixty million years ago, this part of the Gobi desert called Bayanzag was the bottom of an Ancient Sea. The place is known as Flaming Cliffs and if anyone has ever heard of them it is because of the dinosaur skeletons and eggs that have been discovered there. 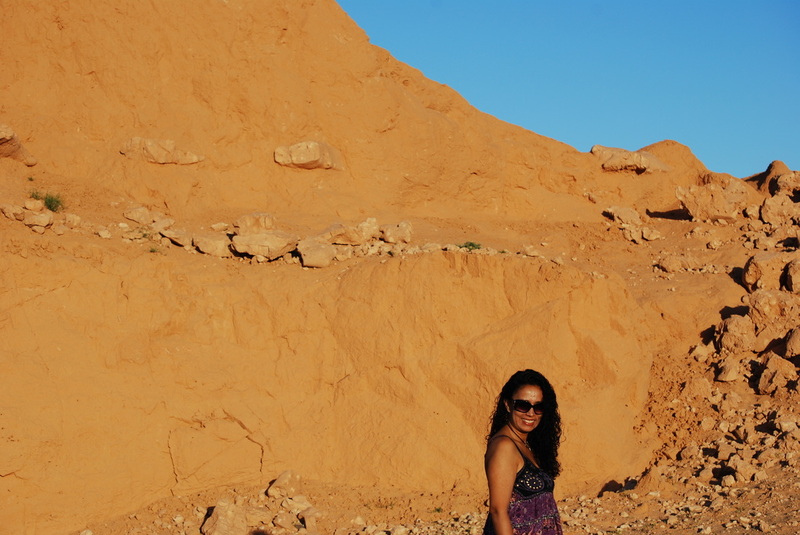 The Flaming Cliffs are not the Grand Canyon or the Badlands. They are quite unimpressive. Really. And if it wasn’t because the sunlight reflecting off the cliff walls makes the formations look more spectacular than they really are, you could drive by and miss them. Yet, I love these two tiny words: Flame and Cliff. Flame conjures up images of things set ablaze, things that burst into strident blasts of angry red and hues of passionate orange. The word flame makes me think of my middle school years when girls used to remove the hair on their arms by passing a candle rapidly over them. They burned the hair off their arms to make them caressable, to offer them naked and soft to boys with clumsy hands and sticky fingers. They singed the fuzz on their arms out of love. So that they were welcomed and accepted and kept. But only little girls do such silly things. When they grow up so does their pain, the caliber of their offerings, and their boldness. Some of them favor self-immolation over singeing. They offer themselves in sacrifice by setting their whole bodies ablaze. They do it as a form of protest, of martyrdom, out of scorn. They sacrifice their flesh and bones in the name of love. Afghan women wishing to escape abusive marriages, Tibetan nuns protesting Chinese rule, Indian widows seeking eternal love throw themselves into their husbands’ funeral pyres. Think heat, your skin peeling off, first crispy then waxy like a candle left out in the sun. Think pain, the fat of your body coloring the flames with traces of bleeding green and tender yellow, turning your midriff into a volcanic blow torch. Flames. Kisses. Passion. That short-of-breathness, the giddiness of a torrid affair, the first love, the first kiss, the first time. Consuming flames that devour and destroy, leaving nothing behind but a mound of smoldering twigs. I once loved a boy who loved alcohol more than he loved me. “Why do you drink so much?” I asked him one day. Cliff. That’s the word that comes to my mind when I think of roller coasters, paragliding, bungee-jumping, sky-diving and gravity-defying stunts, a list that comprises my worst fears. I’m afraid of free-falls, of losing control, of letting myself go. I imagine how splendidly irrevocable the pull of gravity must be as one goes off a cliff. The word cliff evokes memories of that last scene in the movie Thelma and Louise when the women are cornered by police only 100 yards from the edge of the Grand Canyon. They weigh out their options and rather than to be captured and spend the rest of their lives in jail they decide to keep going. Thelma steps on the accelerator and drives the 1966 Ford Thunderbird convertible over the cliff. I once loved a boy who loved his mother very much. On one Mother’s Day, after a weekend out in the country with pals and cheap booze, he drove to his mother’s house. He was too drunk and drove too fast. He missed a bend and his car flew off a cliff. It was a difficult rescue, the firefighters later said. The boy was tall and skinny; he wasn’t wearing a seat belt; the car catapulted his body into the air first, and later into the belly of the cliff. No one was allowed to see his mangled body. A gaping abyss swallowed him whole. 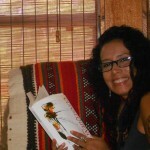 “The Flaming Cliffs of One’s Heart” was reprinted with permission from Adriana Paramo’s blog, TWL. Travel, Write, Live. Adviser Adriana Paramo is a Colombian writer and cultural anthropologist who, following research in Kuwait and the United States, advocates for immigrant women’s rights. She designed a tool to assess the quality of life of Indian servants living in Kuwaiti work camps, reflected in her CNF manuscript, “Desert Butterflies.” Her memoir, “My Mother’s Funeral,” set in Colombia, will soon be published by CavanKerry Press. Learn more about Adriana Paramo here. 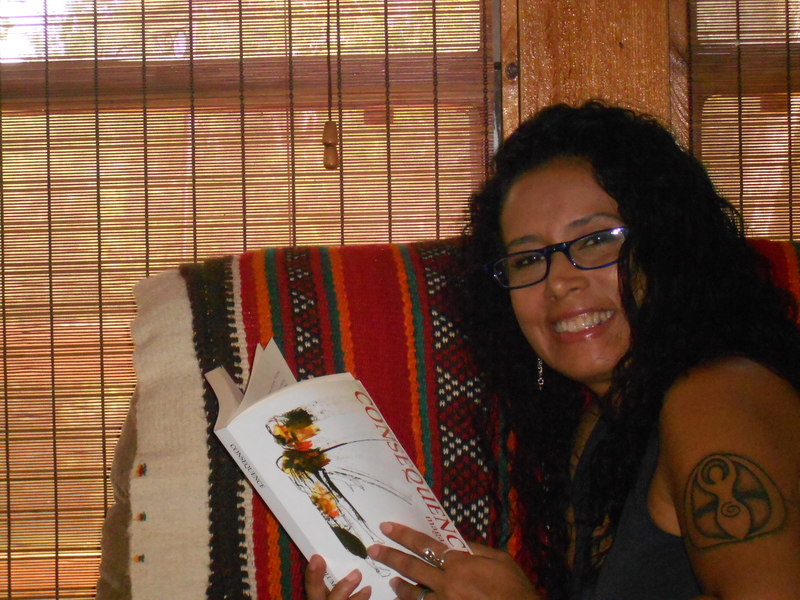 Adriana Paramo wrote about her extensive work with Florida’s immigrant farming community in her book, “Looking for Esperanza,” the winner of the 2011 Benu Press Social Justice Award in Creative Nonfiction. 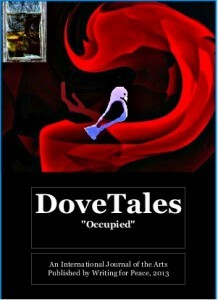 DoveTales is now available for purchase! We are excited to announce that the print copies of DoveTales, an International Journal of the Arts, “Occupied” 2013, are now available to purchase on our website here. DoveTales is a full color journal, featuring poetry, essays, and fiction from our contest winners, established and emerging writers, as well as art and photography. Writing for Peace Artist-In-Residence Pd Lietz’s artwork is featured on the cover and throughout the journal. We are grateful for the support of Colgate University Research Council, which provided a $500 grant as a partial underwriting of the initial publication of DoveTales. In our first issue of DoveTales, writers and artists explored the many definitions of the “Occupied” theme in brilliant and unexpected ways. Contributors include: Chrissie Morris Brady, Andrea W. Doray, Kim Goldberg, Veronica Golos, Nancy Aidé González, Sam Hamill, Denny Hoffman, Michael Lee Johnson, Adam Jones, Ron Koppelberger, Pd Lietz, Paul Lindholt, Cory Lockhart, Shannon K. Lockhart, Ellen Meeropol, Mark A. Murphy, Tricia Orr, Kenneth Pobo, Linda Quennec, Nausheen Rajan, Shirani Rajapakse, April Salzano, Nizar Sartawi, Laura Solomon, John Stocks, Julie Stuckey, Samantha Peters Terrell, Richard Vargas. Contributor biography pages will appear on our website soon. All proceeds for Writing for Peace publications and products go to support our mission, including future Young Writers Contests, DoveTales and other peace publications, and workshops. We invite you to show your support for the Writing for Peace mission by purchasing your copy today! Our 2013 Young Writers Contest closed on March 1st with 106 entries from 21 different countries! Announcements will be made on May 1st, 2013. Participation certificates will begin going out this month. Congratulations to every young writer who participated! The 2014 Young Writers Contest Guidelines will be posted on June 1st, 2013. This entry was posted in Adriana Paramo, Advisory Panel Contributors, Violence Against Women, Women's Equality and tagged Adriana Paramo, Advisors, Cliffs, Esperanza, Flames, Looking for Esperanza, The Flaming Cliff's of One's Heart. Bookmark the permalink.